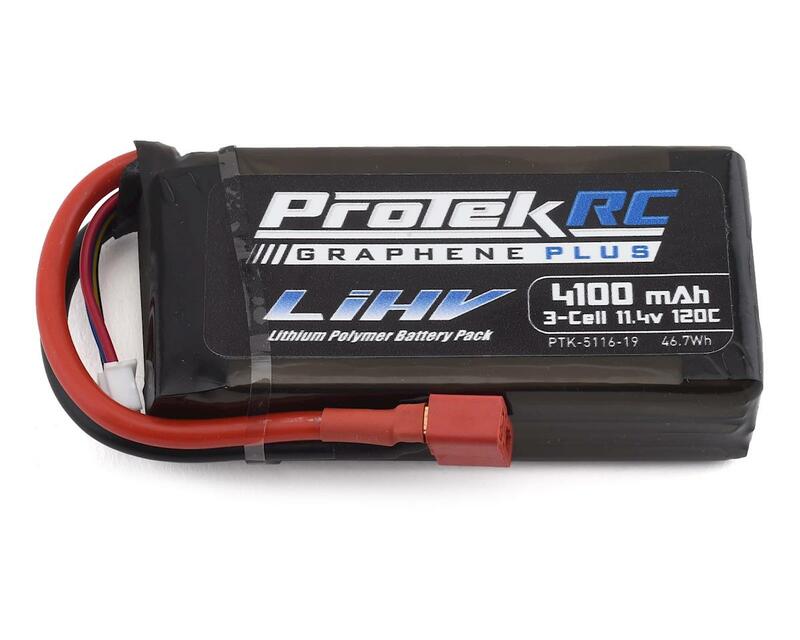 The ProTek R/C 3S 120C Silicon Graphene + HV Shorty LiPo Battery was developed specifically for 1/10 scale rock crawler and rock racer applications. 3S packs that are commonly used in the crawler world are either small, low capacity packs - or large, heavy 4000-5000mAh packs. This 4100mAh battery fills the void and gives scalers a higher capacity option that produces more voltage and longer runtimes than a 2200mAh, yet only weighs approximately 20 grams more! Plus, when charged at LiHV specs this battery produces 13.05V, instead of the standard 12.6V of a fully charged standard LiPo, meaning U4 racers can take advantage of the light weight, and higher voltage throughout the discharge curve to give them a more consistent power delivery with less fade on the track! Want more reasons to run this pack? When compared to standard LiPo and LiHV, Silicon Graphene cells deliver improved efficiency, lower operating temperatures, lower internal resistance, better run time, increased cycle life and increased voltage - but Graphene + 120C LiPo batteries take that a step further with even more power, 500mAh more capacity and lower internal resistance when compared to the previous ProTek 3S LiHV! Lab testing has shown that ProTek R/C Silicon Graphene packs have double the cycle life when charged at 1C rates, and can be charged at higher amp rates, with less risk of damage to the pack. More importantly, the discharge curve is flatter, meaning the cells maintain higher voltage throughout the discharge cycle with no significant drop off. Additionally, when compared to conventional LiPo batteries Silicon Graphene batteries are lighter, providing a higher capacity per gram ratio. 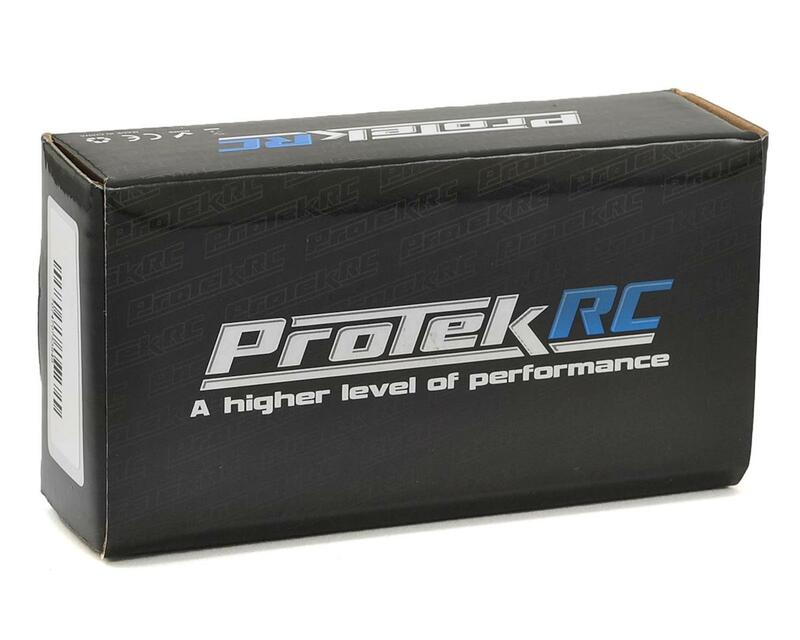 With 7.6V nominal voltage, 120C discharge ratings, incredibly high charge rates and ten different models to choose from, ProTek R/C 120C Graphene + packs are perfect for enthusiasts that demand the absolute best. NOTE: While these batteries are technically LiHV cells, they can still be charged with a standard LiPo charger. The overall voltage and capacity will be slightly less than if charged to LiHV specs, but the performance will be better than a standard LiPo thanks to the reduced weight and low internal resistance. I have one of these 4100mAh batteries that I have tested in my TRX4 rock crawlers over the past 3 months with great results. Plus, they fit in the front compartment of my TRX4s to help with extreme climbing angles. So, I will have more soon. To increase battery life, I always put my lipos into Storage Mode (3.85V per cell) after each use. I have had 6 these battery's for about nine months now. 3 of them have gone bad know. That"s a lot money gone to waste.